Guy Nakashima started as HILT’s Associate Executive Director of Advancement, heading up HILT’s fundraising department, on August 14, 2015. Guy grew up in Central O‘ahu. As a child, he enjoyed adventuring into the woods and pineapple fields that surrounded his neighborhood with his friends. As the demand for housing in Mililani spiked, the woods and pineapple fields that once served as outdoor play areas for neighborhood children were replaced with housing communities. Witnessing the ever-changing landscape of his island community, Guy has dedicated himself to protecting Hawai‘i’s precious natural resources. Guy holds both a B.A. and M.A. in political science from the University of Hawai‘i at Mānoa where his studies focused on public policy. 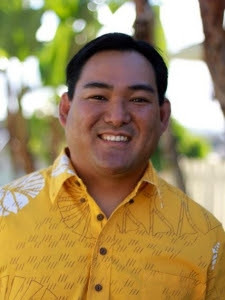 During graduate school, Guy interned at the State Legislature and later worked as a Committee Clerk for House of Representative’s Committee on Education Chair Roy Takumi. 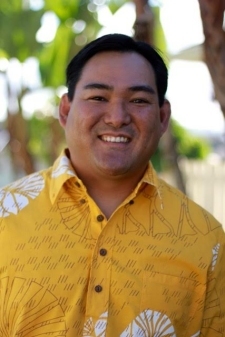 Since his time at the Legislature, Guy has served as the Director of Foundation and Relations at the National Tropical Botanical Garden, the Assistant Executive Director at Hi‘ipaka LLC, and most recently as President of Grant Works Hawai‘i. Guy spends his free time with his wife Kirsten at the ballpark watching their three kids play softball and baseball. Guy is an avid Brazilian jiu-jitsu practitioner and also enjoys playing recreational softball. Angela Britten started as HILT’s Development Director also on August 14, 2015. Angie was born and raised in Kailua on the island of Oʻahu. She spent her childhood exploring the mountains and valleys of Oʻahu, learning the history and stories of her home and exploring the oceans surrounding the islands as a paddler for Kailua Canoe Club. Angie earned a Bachelor’s degree in English Literature from the University of Hawaiʻi at Mānoa specializing in Ethnic Literature and Hawaiian Studies. She has worked in development for the last 10 years, most recently with Hawaii Theatre Center and before that with Olomana Marketing and Bernice Pauahi Bishop Museum. Angie has served as a board member for a number of nonprofit organizations including serving as Vice President of Leadership for the Association of Fundraising Professionals - Aloha Chapter. Her upbringing and education inspired a passionate love for Hawai‘i and its natural spaces. 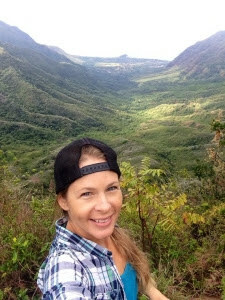 She enjoys practicing Hawaiian language, hiking, paddling and spending time with her daughter. HILT is a 501(c)(3) non-profit organization formed in 2011 out of the merger of four local land trusts, and it is the first and only nationally accredited local land trust in Hawai‘i. Our mission is to protect the lands that will sustain us for current and future generations. HILT has conserved over 17,500 acres to date, via perpetual Conservation Easements and Fee Simple Ownership, on a number of properties throughout the state with various conservation values important to residents and visitors alike. We conserve lands that secure Hawai‘i’s long-term well-being, lands with scenic views, agricultural resources, wildlife habitats, water resource areas, cultural and historical sites, and outdoor recreation opportunities.